Woven bags are popular again - like this “Beach Clutch”. Bold yellow and ruffles - like this cute top. Mixing prints - like this two-in-one top. 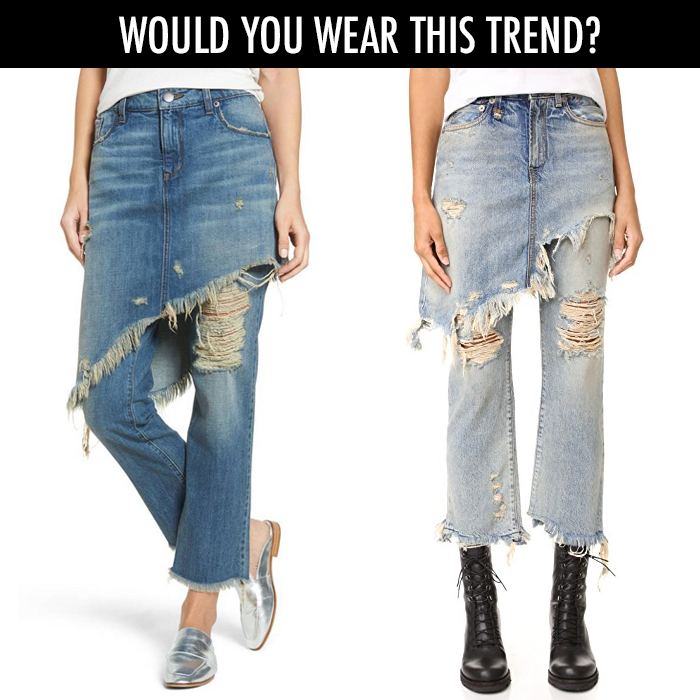 One of MY FRIENDS shared this denim "trend" below. This grunge-inspired jean/skirt look will probably not be showing up in my closet anytime soon. Can you guess which one below costs hundreds of dollars - the one on the LEFT or RIGHT? This $20 striped sweater (also comes in many solid colors, too). This cute skirt that is 50% off and under $25. These faux suede pants (could be worn to work) for only $35. This relaxed crewneck sweater - that comes in a pretty coral color and is 40% off. This sweatshirt is on sale for only $10! This charm set is on sale for only $5. This fun ruffle top is only $20. This stackable ring set is on sale for $10. This cozy knit sweater is only $35 - and comes in three great colors. 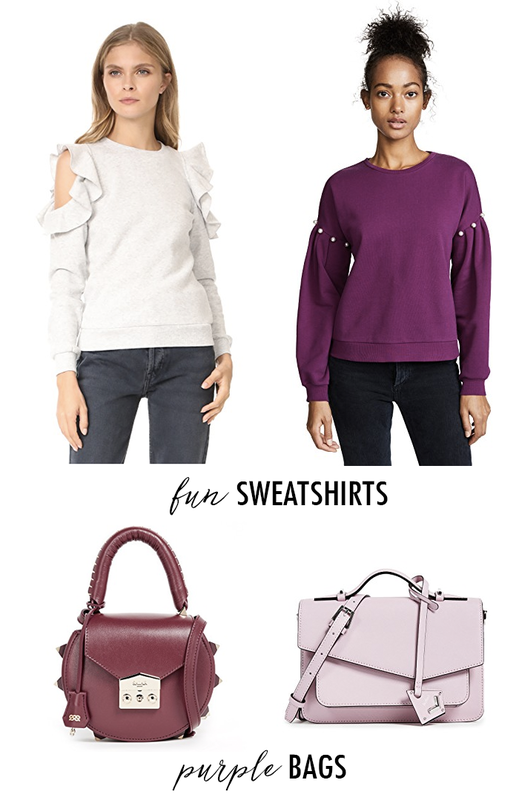 There is an additional 25% off designer sale - with up to 70% off popular bags, my favorite velvet embroidered mules, and sweaters and tops for spring. The purple bags are so pretty, but I am going to pas on the distressed denim at the bottom. Hahha! I also love the white shoe trend! I'll skip that denim trend - while it doesn't appeal to me I'm sure there are some fabulous women who will rock it! I like all the other trends - buying a purple handbag would be a great way to incorporate the trend of the year into a wardrobe. I'm loving all these trends, babe- especially the shoes! Yes! I am all snout purples and florals for Spring. Heading to Shopbob, I may need those bags! I love these trends. They are so cute. No on the last one! LOL. Love the others. I am always a fan of floral. I love the picks!! The floral dresses are so cute. 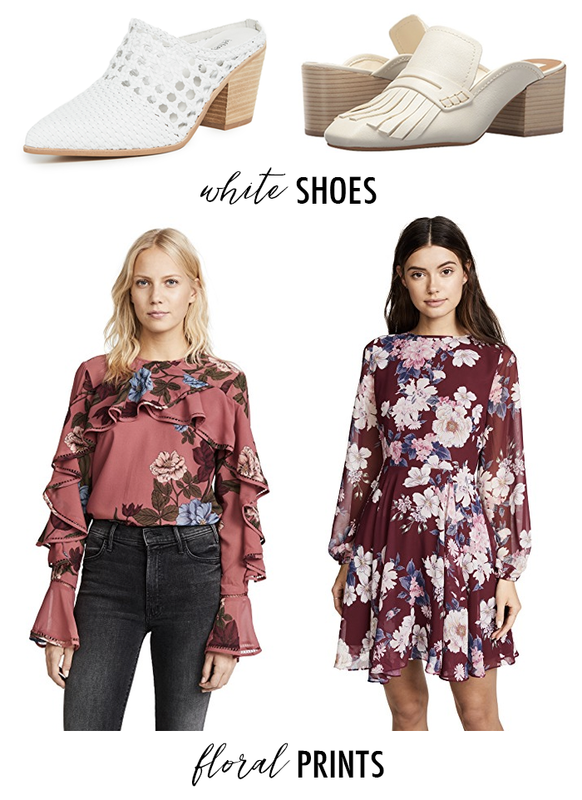 I love your picks for spring! They all are really cute and totally appropriate for spring! bahahahahahaha- love the denim skirt pants! Bhahaha, the denim skirt pants! I saw those and was like, what the heck? !